One of my favorite parts about eating is that it transforms any ordinary day into a trip to a foreign land, and some of my favorite places to go are India, Korea, and Italy. While some people will eat just about anything there are many of us that choose based on our mood, sensations, atmosphere and desires. I am very conscious of my food and the type that goes into my body so when I am craving something in particular I want it to be an experience worth while! On one Sunday morning I woke up with a strong urge to travel, but where did I want to go? Normally this is the toughest part, but I knew immediately I wanted to head south of the boarder down to Mexico. Since one of Keto Connect’s favorite household meals is breakfast, whether it be breakfast sandwiches or breakfast bowls, I knew Matthew would want to go too! The ‘where’ had been chosen so easily, and fortunately, so had the ‘what’… we looked at each other and knew we had to go the route of a Mexican Breakfast Bowl. And thats not even all you could go with… the add ons could be listed for pages! Salsa, corn, green onion, zero carb rice, cauliflower rice, a second meat, lime wedges… I think you get the point. As I mentioned above, we choose based on our mood, sensations, atmosphere and desires and the above four additions were particular to my mood on that Sunday morning. When you are packing (or should I say assembling) and you already know what you need its a quick process. 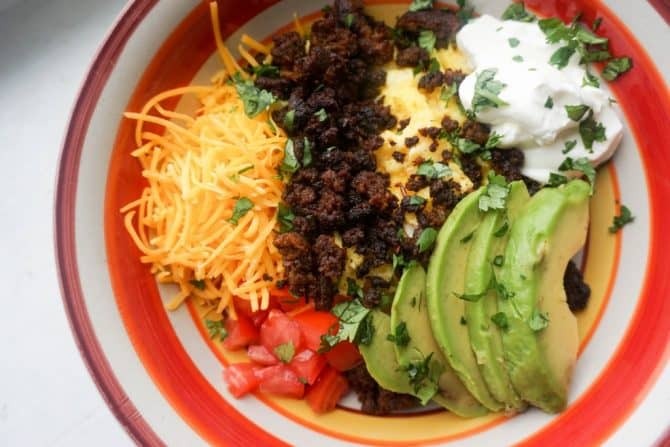 One of my least favorite things to do is pack for a trip, but putting this Mexican Breakfast Bowl together was fun with all the colors and ways you could arrange and layer the ingredients! Sometimes it’s important to get away from reality for a bit and remind yourself of all the wonderful things you’re surrounded by. And, what better way to do this than to create a delicious meal! So, where will you on your next trip? ? Place cooked chorizo on a paper towel and pour out some of the grease (if desired) leaving some to cook the eggs in. Break two eggs into a medium heat skillet with chorizo grease and scramble. Add milk if desired to make it more fluffy. Once cooked place eggs at bottom of a bowl. 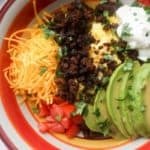 Top the eggs with chorizo and layer on the avocado, cheese, tomato, sour cream and cilantro. Serve immediately while still warm and enjoy your trip to Mexico!